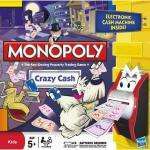 Race around the board spending your Monopoly money and build as many wacky houses and hotels as you can. Catch the cash as it flies from the Crazy Cash machine when you use the Monopoly Credit Card.Chance cards give you choices, what will you choose to help you win? Save and spend to become the richest player... AND WIN! For 2-4 players, ages 5 years and over. Prefer the old one with cash. My daughters have this version and the noise for swiping the credit card gets on my nerves. I've just been in Toys R Us, and it was the same price in there (well, £9.97). I think it might have been in a 3 for 2 offer as well - didn't look that closely.